Thanks, Signazon - Nicely done! 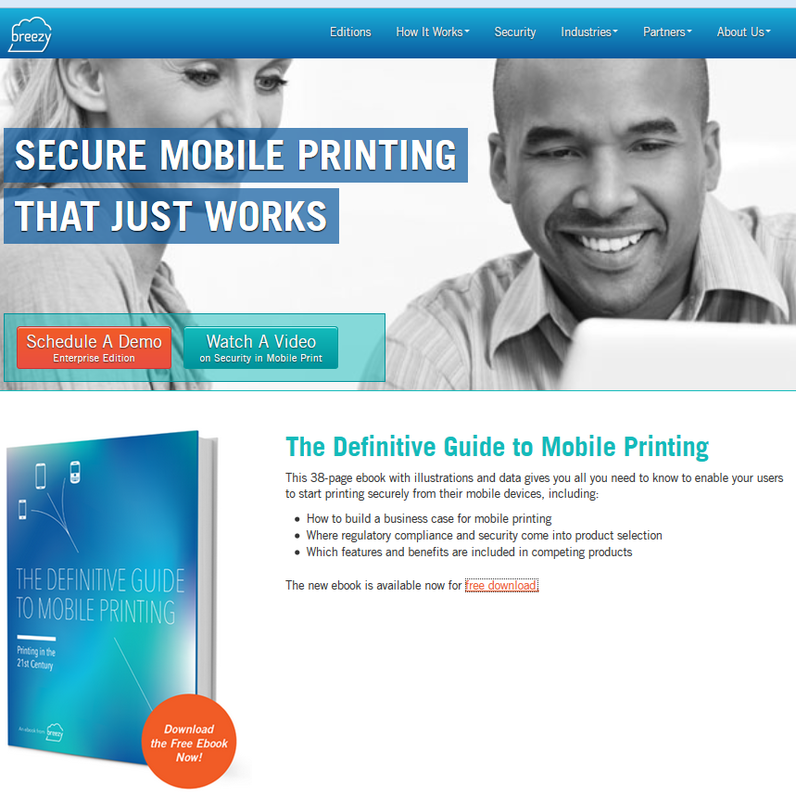 On January 16, 2014, Bay-area-based software firm Breezy, one of the emerging leaders in the ecosystem of mobile printing, announced the publication of an ebook entitled “The Definitive Guide to Mobile Printing.” It’s an attractive, well-written and informative document that should move the needle of common industry understanding. 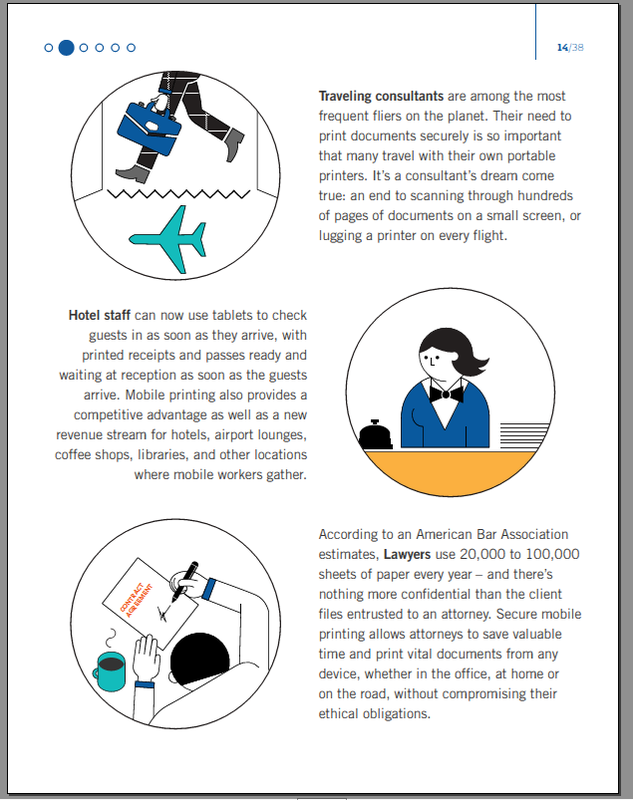 And, while not unexpectedly making the case at the end for Breezy’s particular solution for secure mobile printing (the usual “price” for a free download), I recommend the ebook as an informative and, dare I say, “fun” read. 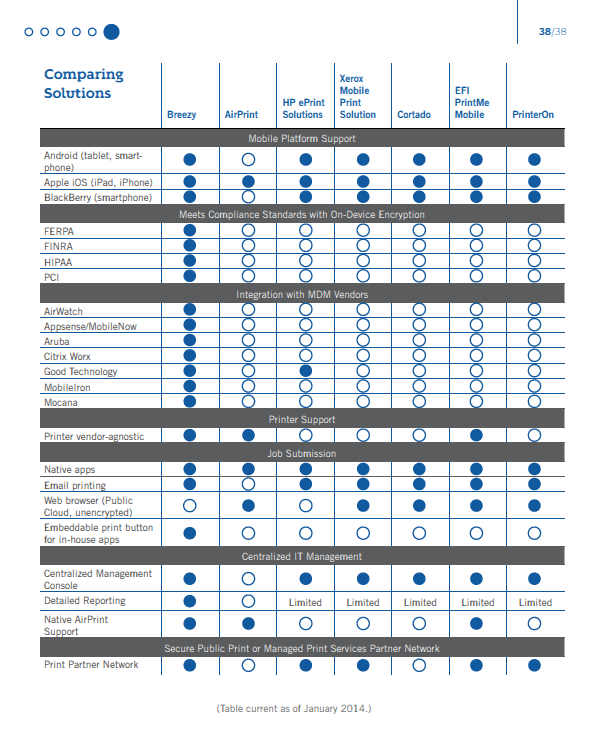 Breezy has a market focus and value proposition, as stated in the the document’s final pages, of “secure mobile printing for enterprises and mid-size businesses that value ease of use, scalability and security.” Its emphasis on describing mobile printing customer requirements (as well as some of the other solution providers/competitors), is what especially stands out for me in the “Definitive Guide,” and it provides insights into Breezy’s areas of market focus. And with Breezy this means, of course, that life is complicated a bit by having two different customers to understand and serve — the IT managers, who are dealing with security and compliance in their new world of Bring Your Own Device (BYOD) and the Consumerization of IT, and the end users, who are actually doing the printing. The “Definitive Guide” covers both with brevity but also acumen. Breezy first came to my attention nearly three years ago when I was writing for The Hard Copy Observer. I wrote my first article in March 2011 describing the story behind the company. Breezy had come on my radar via articles in Venture Beat and TechCrunch, which reported on its raising $750,000 of venture capital, and I was immediately intrigued, for two reasons: first, that any entrepreneur was doing something with printing from mobile devices, and second, because of founder Jared Hansen’s personal story of building the company. I found it compelling that Hansen, trained in the law and working as a corporate lawyer, had been so frustrated with the dearth of good printing solutions for his BlackBerry that he started a company to do something about it. Since then, I have observed Breezy’s steady progress in filling out its product/solution offering along with becoming a leader in steering the direction of secure mobile printing for the enterprise. 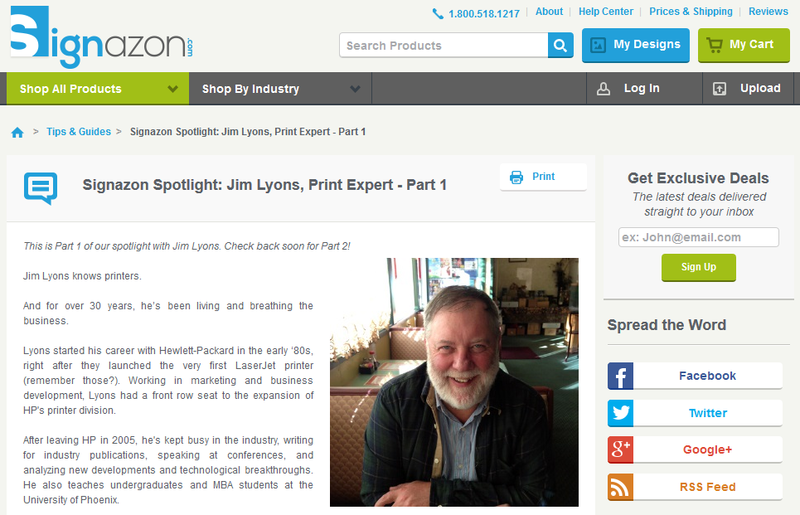 Hansen remains as company CEO today and, previous to chatting this week about the ebook and its launch, he and I talked at length in late 2013 as I was preparing for my mobile printing seminar at December’s Business Imaging Expo in Las Vegas. In that presentation, I quoted Hansen and Breezy’s view of the mobile printing world and used his intriguing graphic comparing maturation of the market to Maslow’s Hierarchy of Needs. 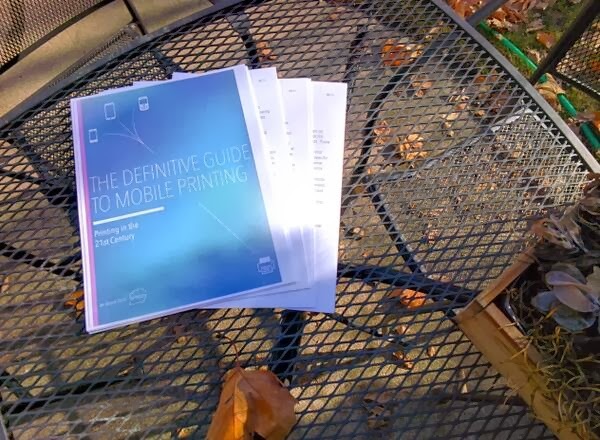 Looking back just a few weeks and building off that December seminar, I wrote a year-end analysis titled “Mobile Printing 2013 — The year inreview — We're getting somewhere!! !” where I not only noted some major industry progress during the preceding 12 months, but I also issued my plea to the industry to become more customer-focused beginning in 2014. My reaction was based in part on the oft-repeated “challenge and opportunity” research data many firms have offered up — numbers about how many millions and now billions of smart devices are out there and how users report needing/wanting to print from these devices but who are, in large, unaware or at least confused by how to do it. The logic follows that given the education and tools to do this printing easily, the number of pages printed will soar, making hardware and supplies vendors happy and offering an escape route from the “death of the PC” trends that are so prominent in today’s technology and business press. As I should also mention, in what will come as no surprise to regular readers of Jim Lyons Observations, I also enjoyed the ebook’s “setup” section featuring a brief historic perspective of the industry, starting with printing itself and leading into today’s explosive growth in the mobile space. The “Definitive Guide” also provides history and background on data security and related compliance issues. Breezy’s ebook, a 38-page PDF, is probably reaching by calling itself “The Definitive Guide,” but I found the length “just right” in terms of getting into some, but not too much, depth behind the important topics in the business right now. None of those is more important than the customer needs — again those being both the needs of IT managers and end users. The Party's Over - #CESPrinters dominated by the 3D variety! Starting a week ago, I began tracking Consumer Electronics Show activities online, after having decided to sit out this year's Las Vegas spectacular. 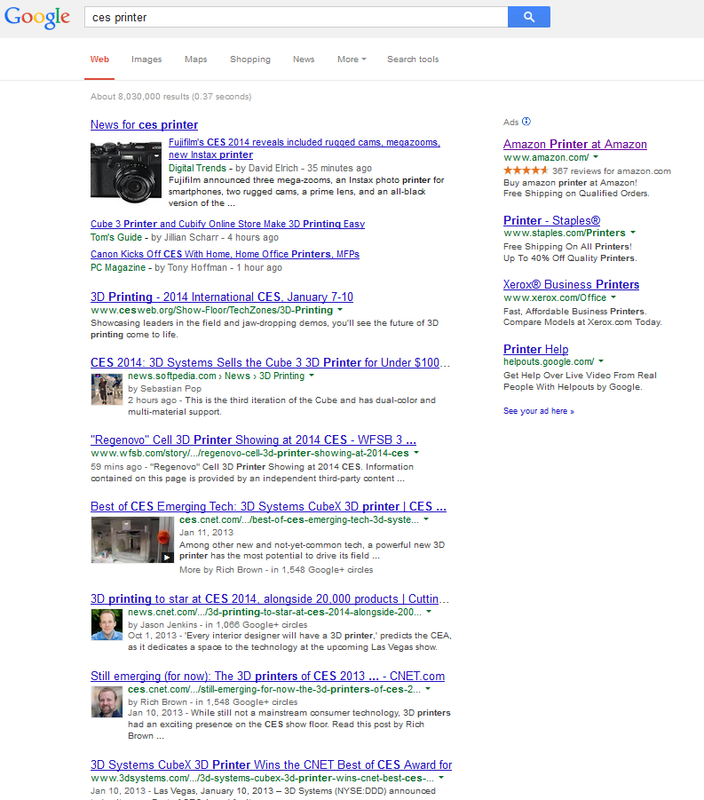 And while not on my regular "beat", I've followed the development of the 3D Printing field for over a decade, so it's interesting to see the category gain so much attention, and now swamping, at least from a "Google search" perspective, traditional printers and printing. I am sitting out this year's Consumer Electronics Show, with typical mixed feelings. As I find myself drawn more and more to other "beats" beyond printing and imaging, those feelings of "missing something" are definitely there, but the grind of the sprawling Vegas show is not a part of what I'm missing! Just back to that "printer beat" for a moment, however, here is a dramatic if simplistic example of the surging interest in 3D Printing, while at the same time the quiet nature of the "old" business is highlighted as well. 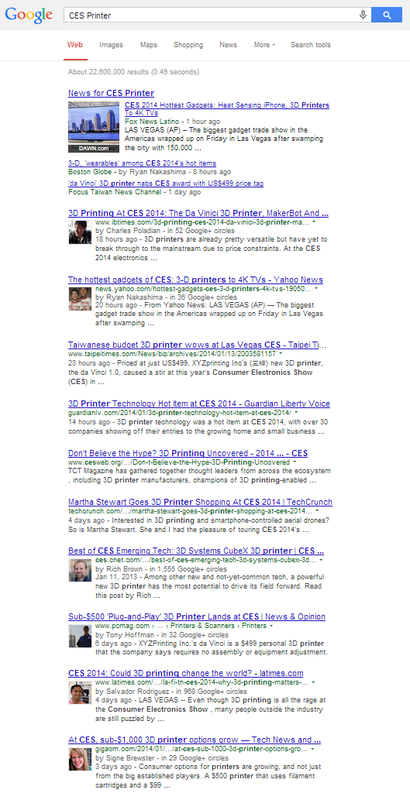 A Google search on this opening morning of CES, on "CES Printer", yields a page-one listing (partial screen shot above) of 12 items in its organic search (main column), 10 of which feature 3D Printer stories. And one of the other two features Fujifilms's new cameras, as well as the cute little Instax pocket printer designed to provide prints from Smartphones.